This 2-Piece Essential Pillowcase Set by Becky Cameron is the perfect addition to your bedding. Crafted with the finest microfiber, these pillowcases are gentle, durable, and stain resistant. These pillowcases are completely wrinkle free eliminating the need for ironing. Because we care deeply about your quality of life, our microfiber products are 100% hypoallergenic, antimicrobial, and antibacterial. •	2 Standard Pillowcases: 20" x 30"
•	2 King Pillowcases: 20" x 40"
Dimensions 40.0 In. X 20.0 In. X 0.1 In. Just received the Pillowcase set of 2 in King Size in Light Grey, Grey and Black. Like the light grey best. These pillowcases though not of A cotton material feel very soft and smooth right out of the package. Still, I plan to wash them and use Fabric Softener as well to enhance their softness already present. The colors are true to form! The pillow cases are a little thin for my taste. It's pretty good for the price. I have about 15 pillows on our bed and we just got a whole new bedroom set and the comforter set. We went white. Going for the country look. I will post pictures after all the dogs and we are out of bed. Just finally got the bedroom finished. Beautiful sage green color, very soft! Quality is better than I’d expected, matches the cotton sage green throw I also found at overstock. Another fabulous purchase! These pillowcases are very soft. 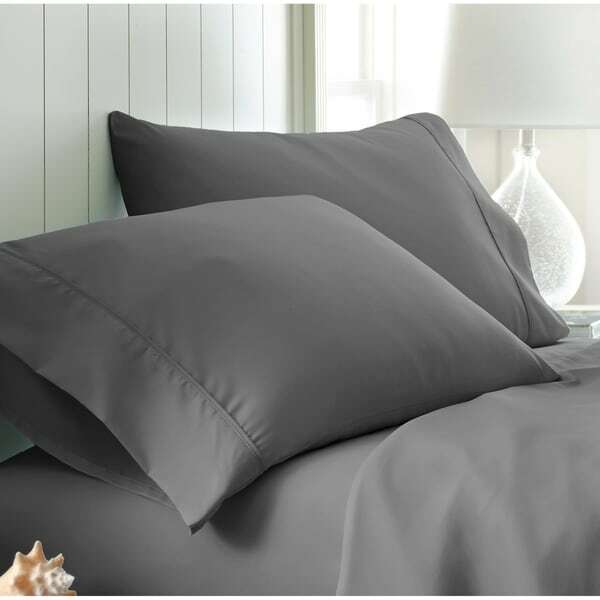 I ordered in gray to match a sheet set I have and needed an extra pair of pillowcases since I change my pillowcases every couple of days since we live in a hot climate. So far they are holding up very well when I wash them, the color and quality. I recommend this product. Love these pillow cases. The size is accurate as well the color. I have washed them and they did not fade or bleed color. Not as soft as I expected but otherwise a great purchase at a great price. I would purchase again. These Premium Ultra Soft Pillow Cases Set has got to be the most soft and exactly what they say ... winkle free material that I've ever ordered. I actually bought two sets and when I need more will certainly order these. Thank You Overstock for another great item! Pillow cases match the sheets. My review on them: These are great sheets. Really soft and fairly wrinkle free. Not the prettiest / most decorative set of sheets, but very comfortable. Bought additional pillow cases to use with the Becky Cameron sheets which are super soft and comfortable. These are the best sheets ever!!!! These pillow cases are silky and soft. I bought sheets that came with 2 pillow cases so I ordered these pillow cases to match. I love to have at least 4 pillows on the bed. Definitely would order again. Matched sheets perfectly, nice big size and quality, held up well in the washing machine also. Would order again as well if need more. The sheets and pillowcases hold up very well I only ordered extras because I bought more pillows!